Nice, care, friendly and honestly, good commission rate. A vendor was selling a 3 bedroom House and found Penny via OpenAgent to sell her property. This agent was very patient and went above and beyond to ensure the sale was a success. We had moved interstate, but the communication and regular updates on progress, as well as organising remediation works were seamless. This agent is highly recommended. This is a review a vendor left on Penny through the OpenAgent site. Being a first home buyer, I feel this agent was very helpful. She always answered the novice questions I had and guided me through the process. 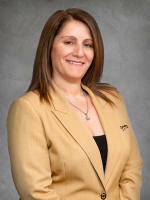 Penny Stylianou has sold 59 properties in the last year. They’ve recently sold properties in Toongabbie, Blacktown, Seven Hills, Lalor Park, Prospect, Kings Langley. A recent sale was a 3 bedroom house at 9/14-16 Marcia Street, Toongabbie. Their highest sale in the last 12 months was a 5 bedroom house in Lalor Park for $965,000. Penny Stylianouwill get back to you shortly. What can Penny Stylianou help you with? Looking for more agents in seven-hills?